The feed is rich. Public safety, utilities, work crews, airplanes, ham repeaters, boats… even the comings and goings of the ferries that connect our island to the mainland… all contribute to an overall sense of having my finger on the pulse. I don’t often need this, but I like it… which is justification enough. And during weather emergencies, it provides essential information that is more of a pain to extract with just a marine VHF. But for the Datawake console, I wanted something built-in… one of the primary design goals here is to eliminate loose fiddly gadgets with random cables and battery management quirks. The project calls for an embedded scanner that interfaces well, is easy to use, handles digital trunking, and is more or less future-proof (at least for my casual needs… I’m not a hard-core hobbyist like the folks who live over in the excellent RadioReference forums). My default plan for a long time was the BCD536HP, which is pretty much the flagship of Uniden’s scanner line. This would panel-mount well (DIN standard) and has the maximum feature set, but the user interface is deep and complex. I preferred something easy to use, pretty, and readable at a glance. 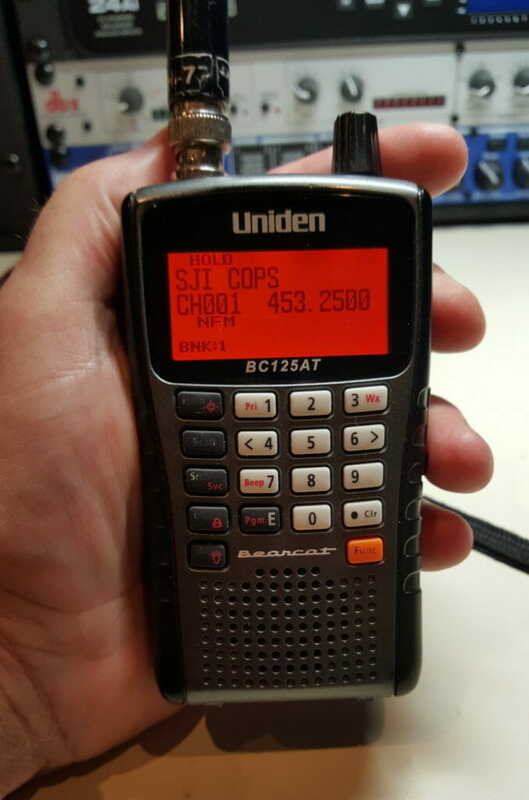 The Uniden Home Patrol 2 is the beast I chose, and I’m very happy with it. There are a few features missing compared to the 536 (no service search, close call mode, or priority scanning), but it makes up for that with an added “Extreme Upgrade” that offers a suite of geeky tools. 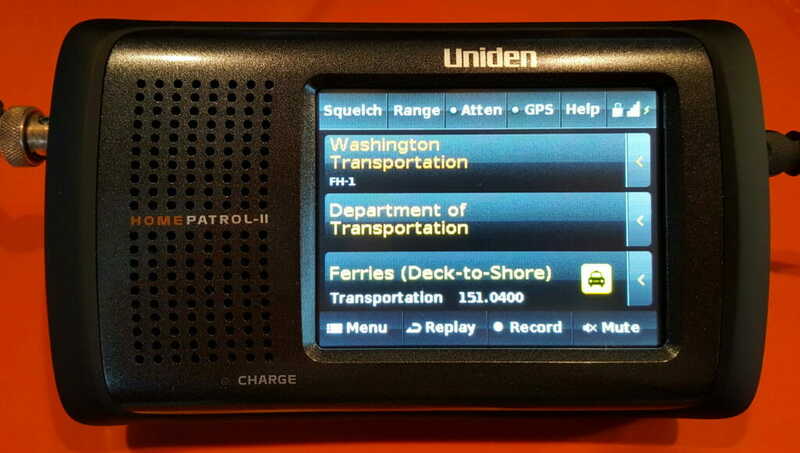 The user interface is a color touchscreen, it records to an SD card, and it can accept GPS input to automatically scan the local subset of the entire built-in (and updatable) RadioReference database as you travel. My initial learning curve on the associated Sentinel software gobbled an evening, but it’s now running on the NUC and everything works well. So let’s install it in the boat! The first thing that struck me when I received this is that sticking it on the panel was going to be even uglier than I had anticipated. My usual heavy-duty Velcro method would be sloppy, depending too much on the stability of the battery compartment cover, and I worried that it would wobble enough to be irritating when I pushed on the top-panel controls for power and volume. But a little bit of research turned up the BCKHP1 mounting bracket, pricey for a simple piece of plastic (and yes, I looked first on Thingiverse to see if anybody had already published an STL file that I could print on the LulzBot). OK, fine, given the amount of time this saves… and boom, problem solved! There are four cables that had to be routed through the panel, plus an earphone connector that I’ve left available if I want to skip the ship’s audio network. This called for a bushing at each end, tucked out of sight behind the rig thanks to the space provided by the bracket. Let’s define these interconnects. 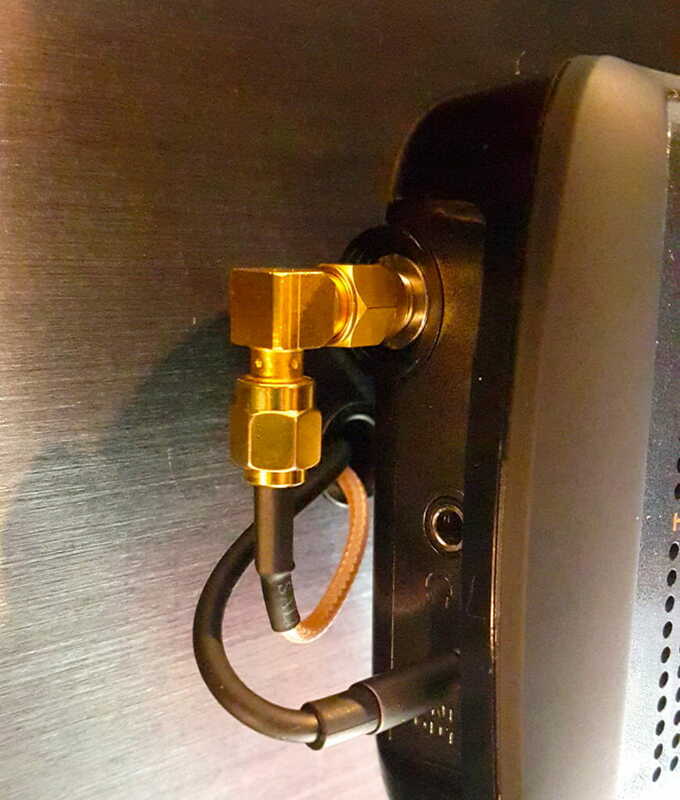 SMA connector for antenna input… a bit of a pain as it has to make the leap from that delicate connector to the stiff “pipe” that is my LMR-400 feed line. 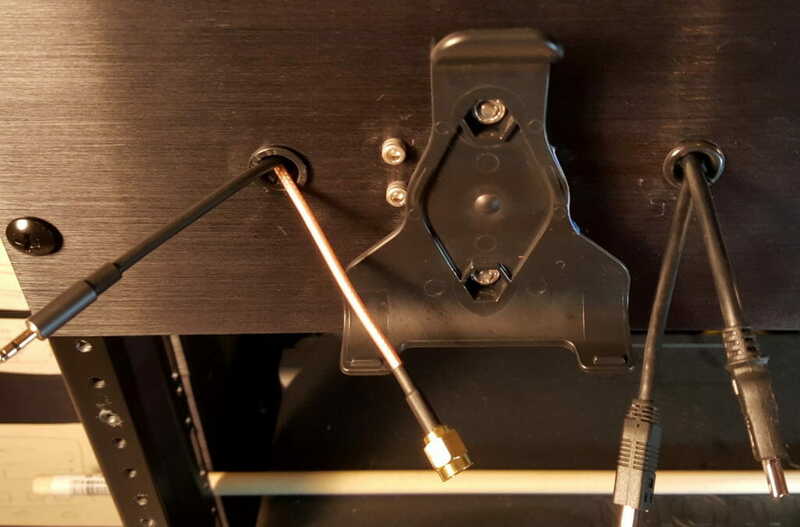 This coax will forever annoy me whenever I pull the Epsilon cabinet out for service, and the solution was to fabricate a little bracket for the N connector, mounted on the back side of the panel behind the scanner (photo above). 2.5 mm Line-level audio output… requiring transition to the more useful 3.5 mm via a jumper cable, which then connects to a transformer-based isolator since the scanner has a completely different concept of “ground” than the audio gear that will be receiving the signal. Mini-USB for data and power… piped to the Anker 13-port aluminum hub hanging off the Intel NUC that runs all the ship’s Windows-based comm apps (including SDR, Icom front-end, tools for radio programming, digital modes, and of course Uniden’s Sentinel). When starting the scanner, it asks if we will be using the USB connection just for power, or as a data source from the PC. GPS input (USB Mini 4-Pin)… an odd connector, acquired by hacking a “Rosewill” cable that will lose its other end, then make its way over to a terminal block carrying the NMEA0183 feed from a Garmin puck GPS mounted on the upper deck (also used by other radios, APRS, and the iKommunicate gateway). In the photos above, you can peek under the body of the scanner where the cables pass through the 19″ aluminum panel. I used Heyco split snap bushings that let me get away with pre-terminated cable, calling for .5-inch holes. 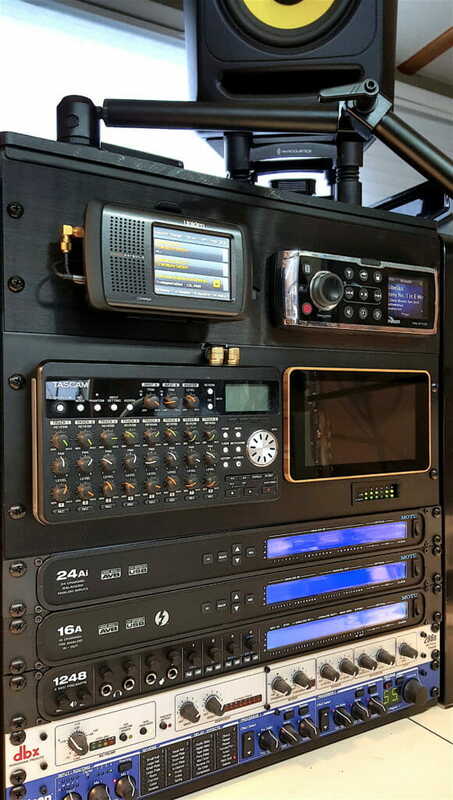 You see that photo above with the scanner mounted next to the Fusion MS-IP700 marine stereo? That thing owns a serious bundle of cabling, which is already integrated into the system and nicely tied down. I kept putting off this installation job, dreading the process of taking it all apart and having to put it together again. OK, with that all done and the rig mounted, let’s get a skyhook up and run some cable! All along, I’ve been assuming that I’d install a discone (the venerable Diamond D130NJ). These work from 25-1300 MHz, though being broadband there is certainly no gain to speak of. Also, aesthetically, they scream “SCANNER!” I was having trouble getting excited about one of these, and kept delaying an order as I prowled for a better alternative. In some forum I read glowing comments about the DPD OmniX, reportedly an excellent multiband performer and well-made to boot. OK, why not? Let’s try one. 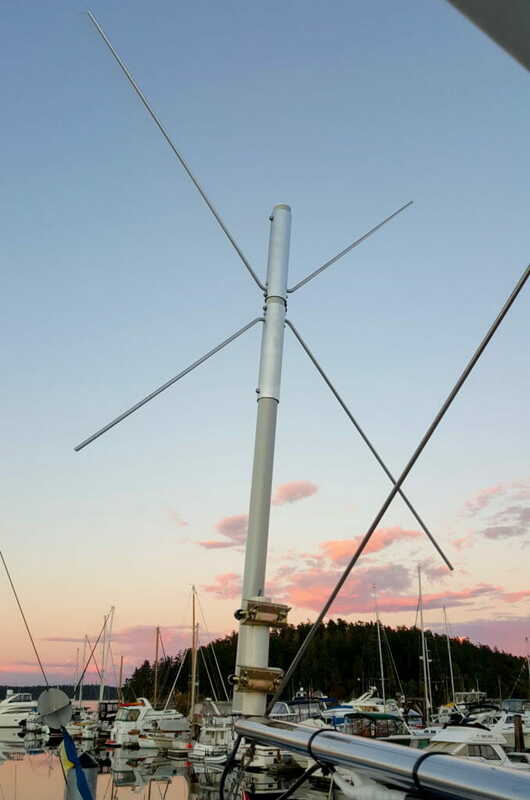 This is an interesting design, with three dipoles… the two X-element pairs of different lengths and the fat vertical body that provides the mounting structure. The coverage is 118-137, 148-175 & 225-900 MHz. I happened to have an obsolete wind sensor mounted on the starboard spreader of my radar mast, so this presented an obvious mounting location. It went up without much difficulty… using concentric split PVC sleeves of two lengths to straddle a step in the post diameter while giving the brackets something that could handle clamping pressure. TV-antenna-style clamps and a chunk of old PVC are not exactly beautiful from a nautical perspective, but it was expedient and I find I’m not embarrassed at all. The OmniX has a female N connector at the end of a pigtail, which terminates under a blob of white self-vulcanizing Rescue Tape zip-tied to the spreader. From there, it’s the 50-foot hunk of LMR400 that I mentioned… stiff and perhaps not the best choice, but low-loss for the frequency range of interest. 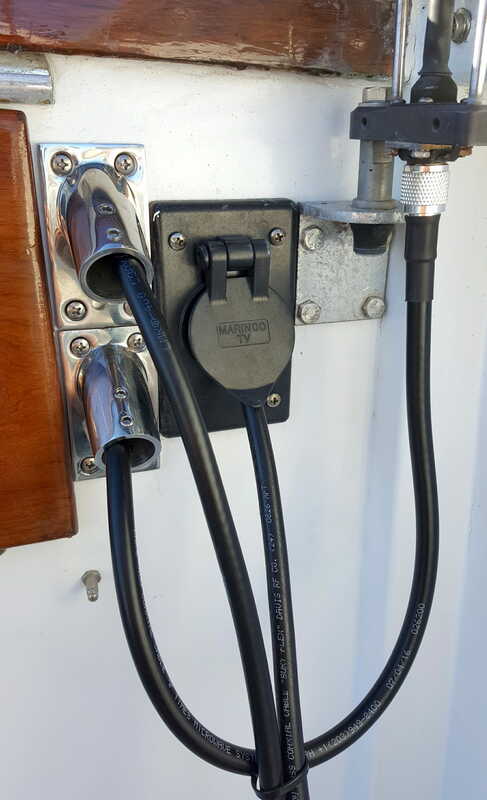 This found its way down the mast, under one of the bridgedeck seat structures to parallel the feed line for the radio-check system, then through the upper console to a spot where it could penetrate the pilothouse roof without introducing water. The photo shows my little trick for getting it through that vertical surface… 7/8″ stainless rail bases, with a hole drilled behind at a matching angle. The bottom one is another run of the same stuff to the dual-band J-pole antenna owned by my Icom ID-5100. 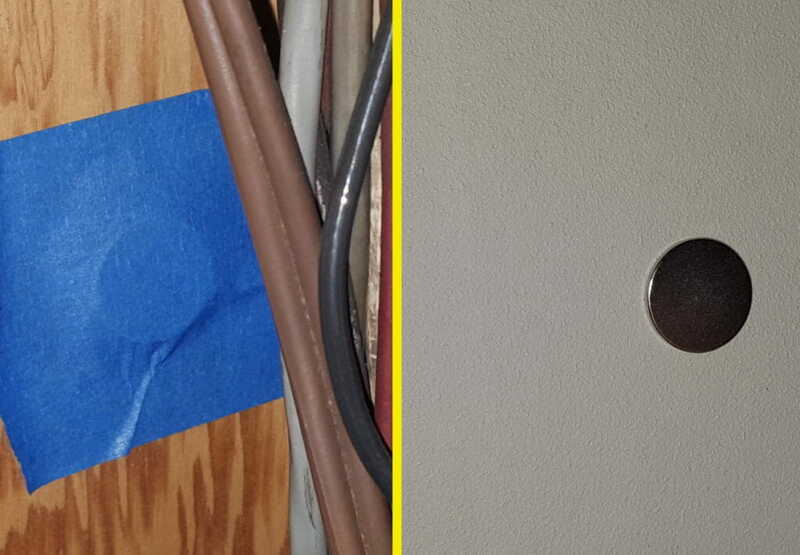 The only other trick of note was using a pair of .75″ diameter N52 Neodymium magnets to locate the perfect spot to drill through the cabin wall, as it is easy to measure incorrectly and poke a hole where oops damn it you didn’t mean to… but all you do is tape a magnet in place, slap another onto the opposite side of the wall, draw a circle, and go from there. 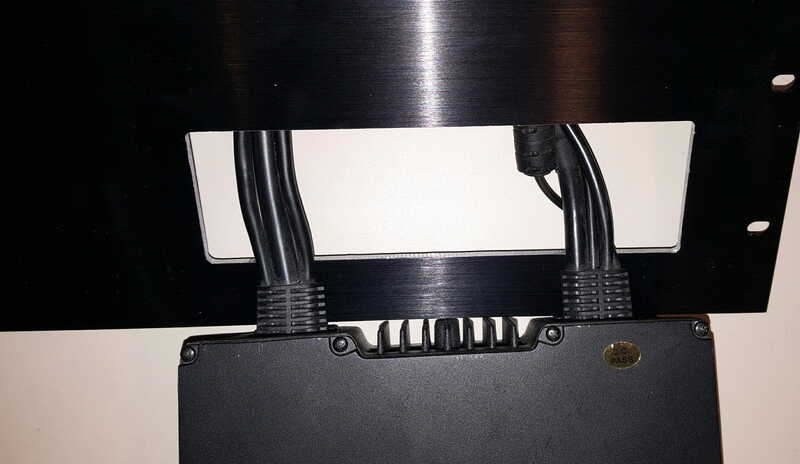 At the console, cable management gets tricky… the bundles are thick enough that haphazard spill over the back of the desk is causing problems. I built a “cable trellis” out of stainless rail, with a long horizontal member spanning the full 8-foot length of the console. Each of the five cabinets has a lacing bar for cable exit on the back near the top, and between those and the trellis are big lazy loops that allow pulling each enclosure out for service. I’ve had this buttoned up for a few weeks now, and love it… I scan about 70 channels, and can lock any out if they get annoying (or hold on one if it is particularly interesting). It contributes greatly to my sense of connection with the nearby scene; I’ve listened to the drama around a plane crash (everybody OK), marine rescues, medical emergencies, routine operations on the waterfront, and general aviation. It’s nice to have some information feeds besides Facebook… and the interface with my audio network means I can pipe this to the cabin or mix it in with recorded commentary. And when there is a wailing siren or a stray helicopter hovering about, it’s good to know what’s going on! UPDATE: In May of 2017, I heard a distress call from Mt. 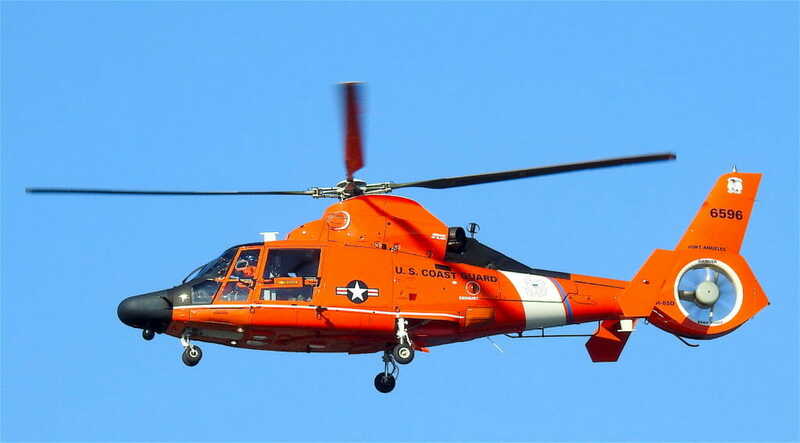 Baker, 56 miles away… recorded it… and got the information to Whidbey Island Search and Rescue. Two climbers had taken an 80-foot fall into a crevasse with their snowmobile after an ice bridge failed, and one had a serious head injury… and their friend was topside, attempting self-rescue. Fortunately, I could hear his calls on GMRS, and the story has a very happy ending. I’ll give this a proper blog post with photos and audio clips, and link to it from here once it’s online. It was a lucky day, and fully justified this project! 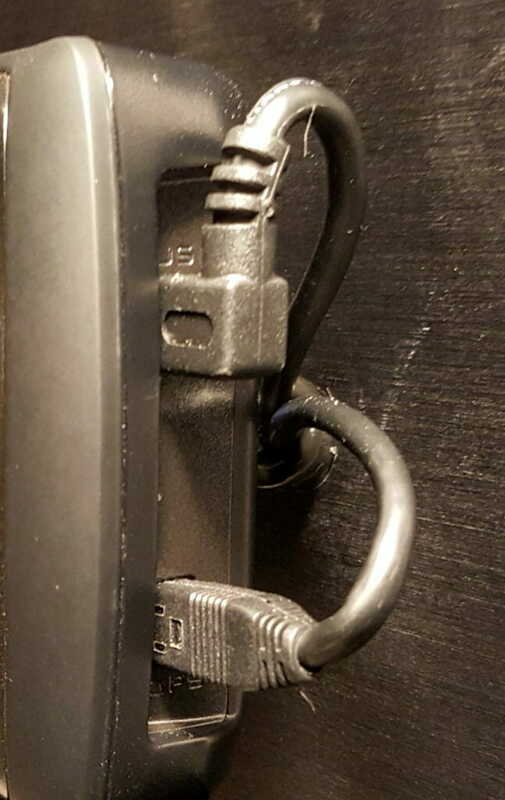 The scanner’s output is not referenced to external ground, so I used that little ground-loop isolator to connect it into the MOTU audio system (described in more detail here). I’ll close with a photo of console zone Epsilon, which is entirely devoted to audio management (with remote web access); zooming out even further, there is a post about the entire console with 60U of rackspace on an 8-foot desk.